I started with the DSP called Picture Perfect Party. on the left side. I layered it on Pool Party and then Berry Burst. 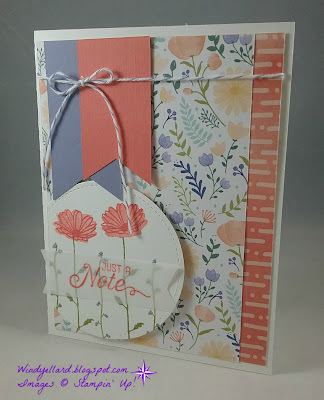 on Whisper White and cut it out with my Layering Circle dies. 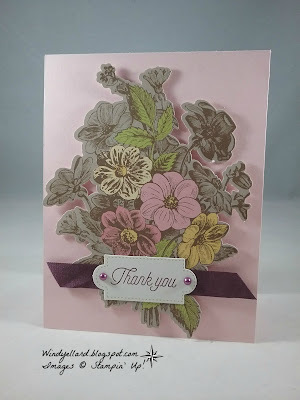 I then finished it off with a silver foil doily. This card is very bright and ready to party! Thanks for stopping by and have a lovely last day of March! 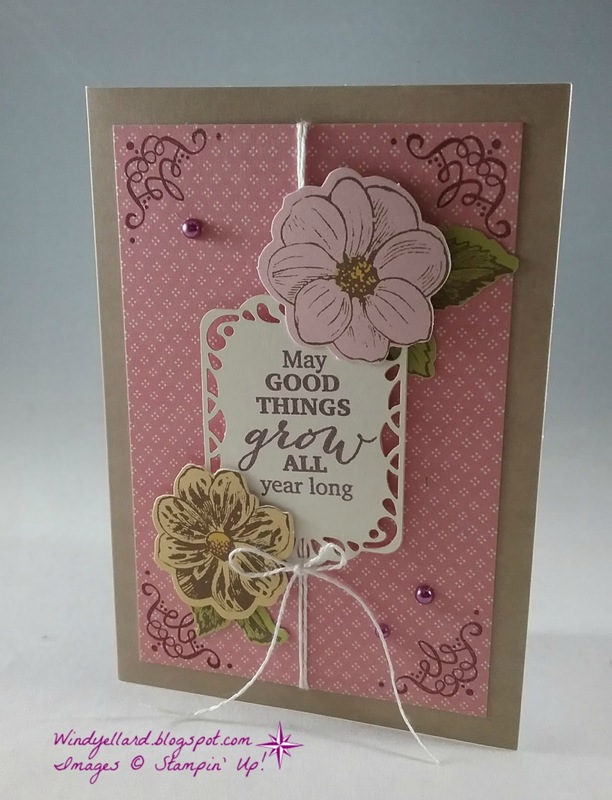 I love the Sweet Soiree embellishment kit! 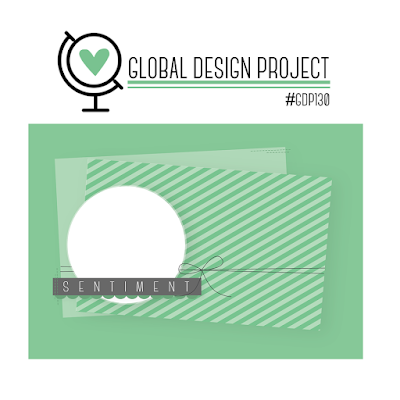 to color then stamp the sentiment. of thick Whisper White for the base. 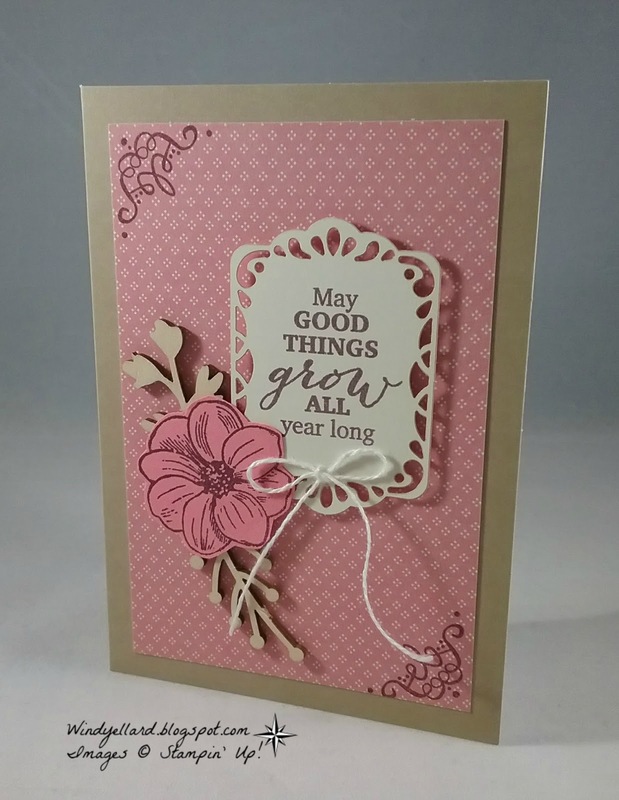 of card stock and ran some Marina Mist trim behind. The vellum silver flowers and stems give it a elegant look. 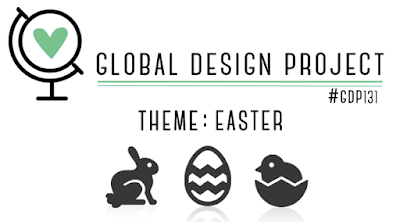 decided to play along with the challenge over at global-design-project.com. I made this Easter card and will give to a friend this week. 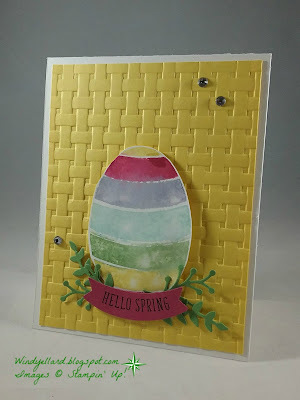 sponging this week so tried it with post it notes. used four post it notes to hold in place and give me a sort of straight line. Even with lines I could not it it perfectly straight! Bermuda Bay ink-looks like grass and sky! Tuxedo Black over the sponging. I added the Happy Easter from the same set at bottom. 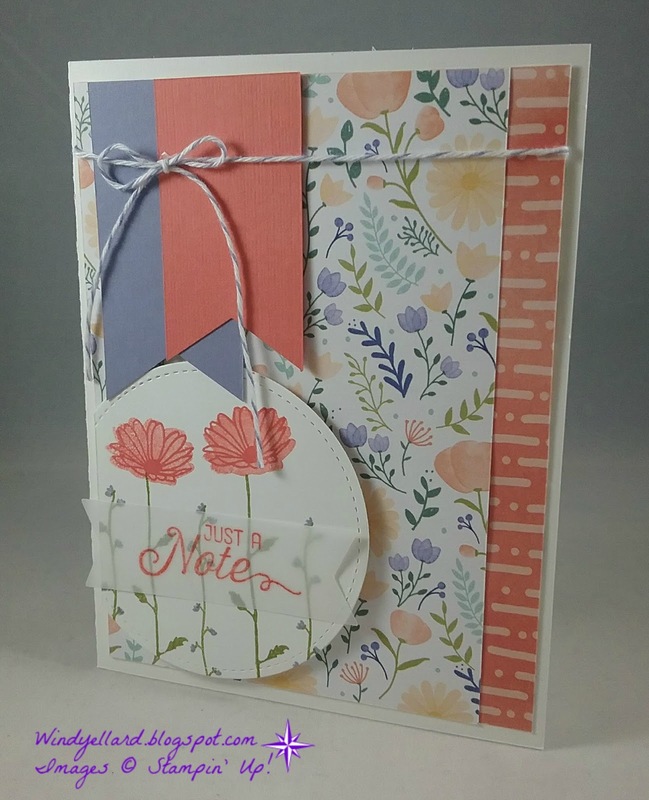 across the card plus a small bow. 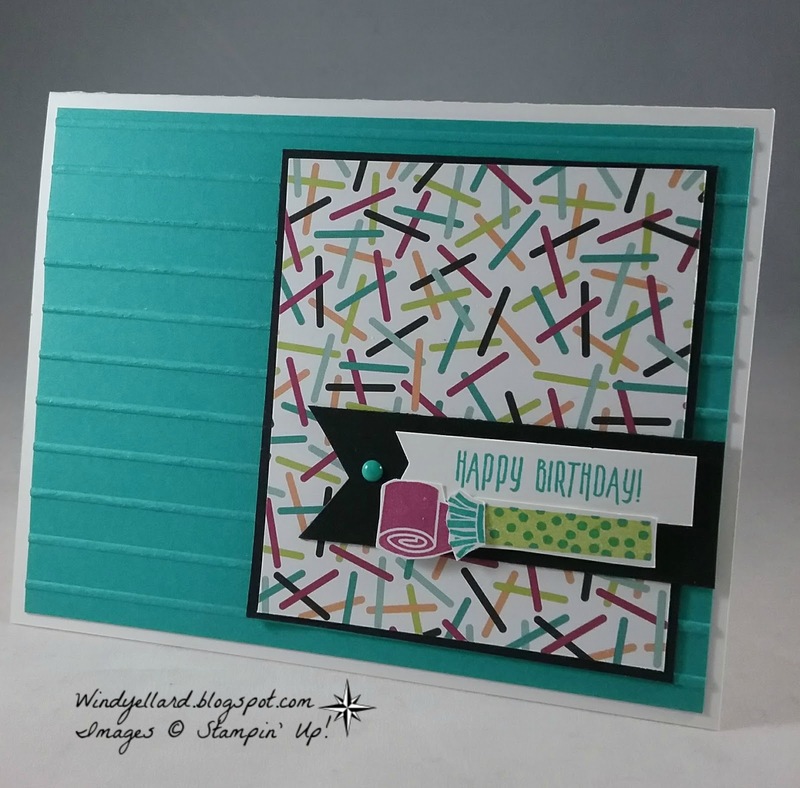 and Lemon Lime Twist card base. I finished it off with some glitter enamel shapes. I hope you have a beautiful day and Easter celebration! this week, I thought it was my chance. I went for the wild flowers. and cut a little off the side for the sketch. 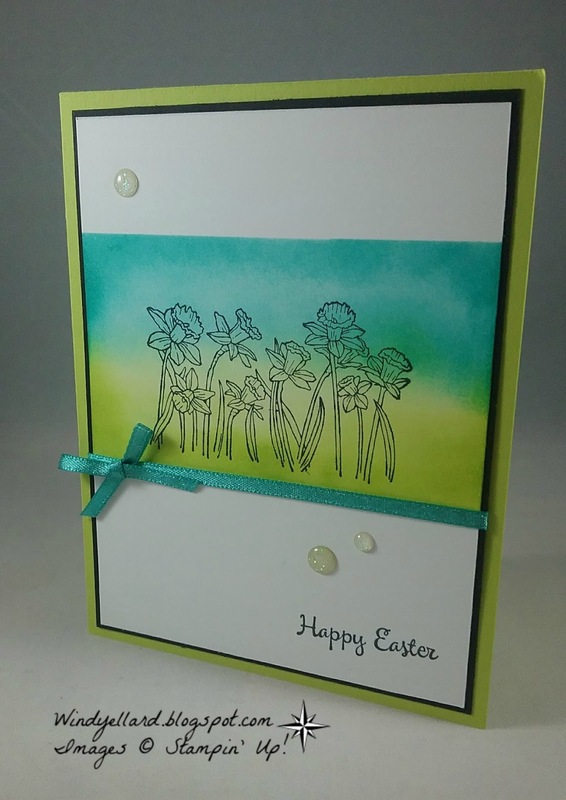 I stamped the stems in Old Olive ink. 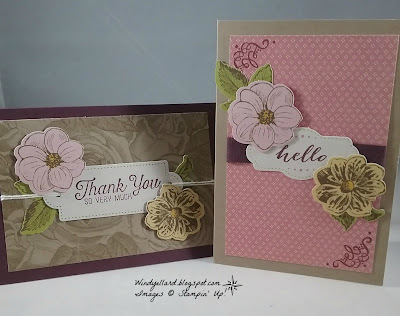 ink and then two step stamping for the larger flowers in Calypso Coral ink. 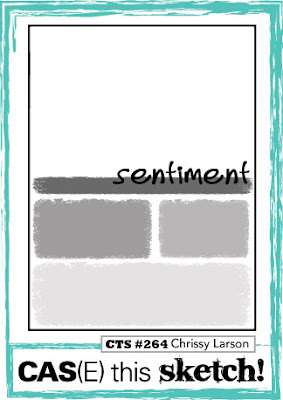 to stamp the sentiment in Coral from the Flourishing Phrases set. running some retired Wisteria Wonder baker's twine and finishing with a bow. I really like all these colors together! Here are my first three cards from the kit. the top left card is a full size card. 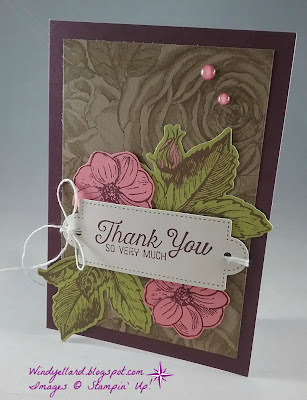 and the Thank You sentiment from a past PP kit on the tag. in Fresh Fig from Flourishing Phrases stamp set. 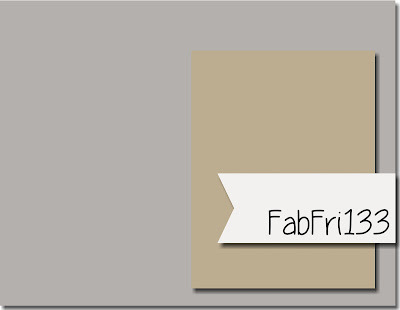 and changed the layout...really like how it turned out. it on a Flirty Flamingo base. then popped it on a Fresh Fig base. I stamped the flower on Flamingo paper in Fresh Fig and hand cut it. Love the wood elements we got as a free gift. More wood elements here on the left. 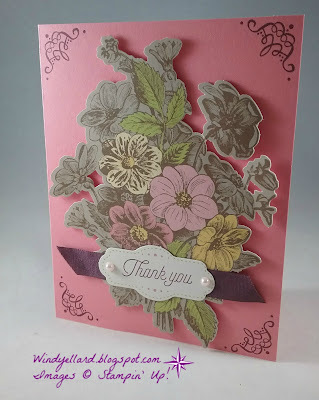 I love vintage style card which I really do not do much of anymore. So this kit was so much fun for me. Hope you have a lovely day and happy stamping! I like this sketch...it looked like a brick wall. and finally did a scene other than the beach. streams, but mostly the ocean! I moved to Night of Navy and flipped the stamp to look different. 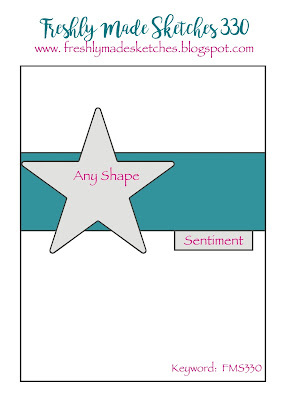 gave the finally layer except for the sentiment. 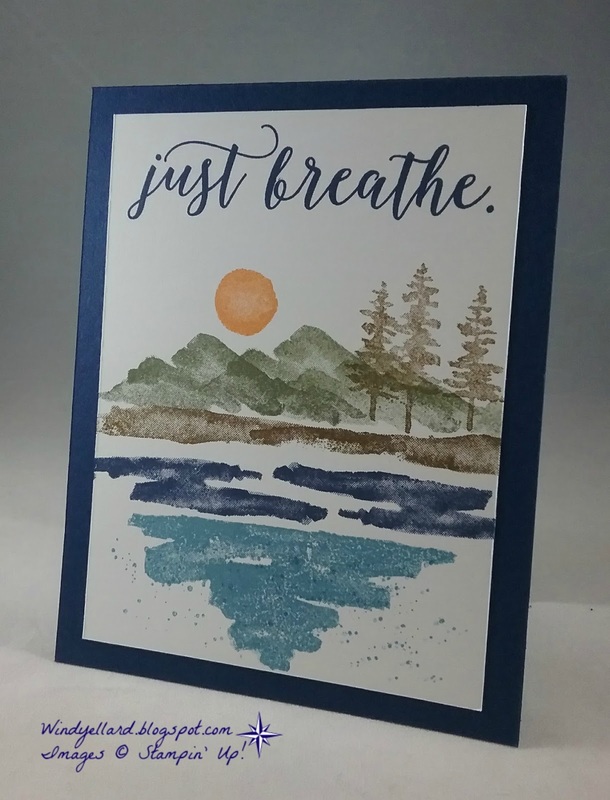 I decided on the Just Breathe from Colorful Seasons in Navy. for a sunset kind of look. and relax and breathe some fresh air this week! I went with the top row for this challenge- Twine, Bold Statement, Red. feature it today with the red in the challenge. 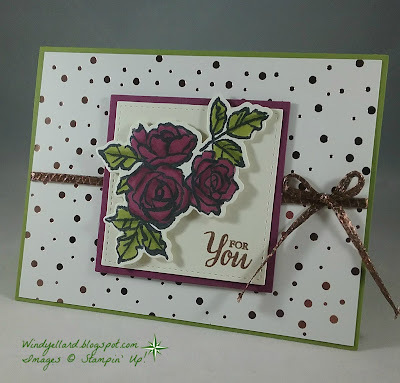 I used the Petal Burst embossing folder for the background. 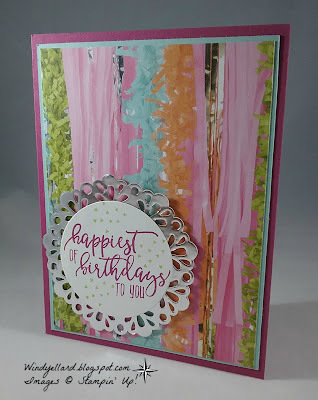 I layered the background piece on a thick Whisper White base. this year and so I stamped the Happy in Memento Tuxedo Black. from the same set in Rose Red ink. 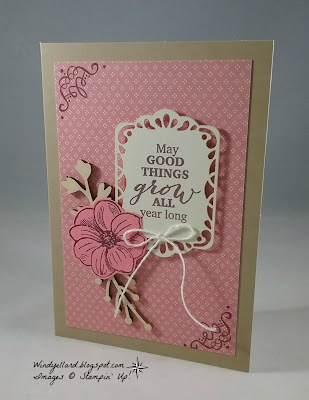 used scallop die in the Seasonal Layers thinlits dies. some black and white twine around before adding a bow. 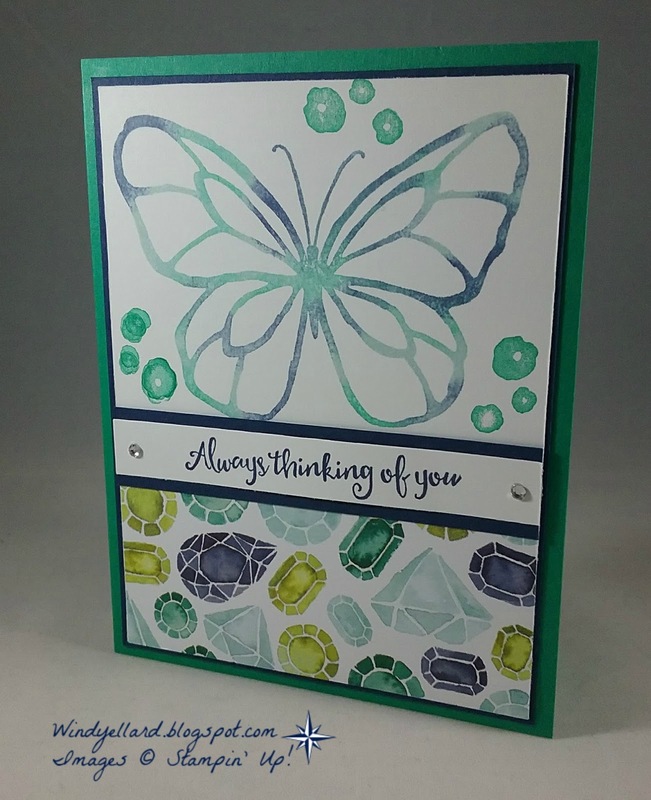 A few rhinestones finished the card off. I hope you can play along with the tictactoechallenge.com this week. with the new festivefridaychallenge.com this week. SAB is winding down with one week to go. The promotion ends next Saturday on March 31st. You can earn free items for each 50.00 you spend. 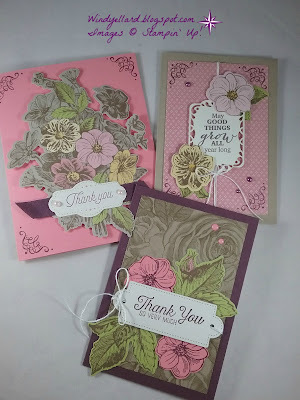 you could earn with 100.00 purchase of Stampin' Up! 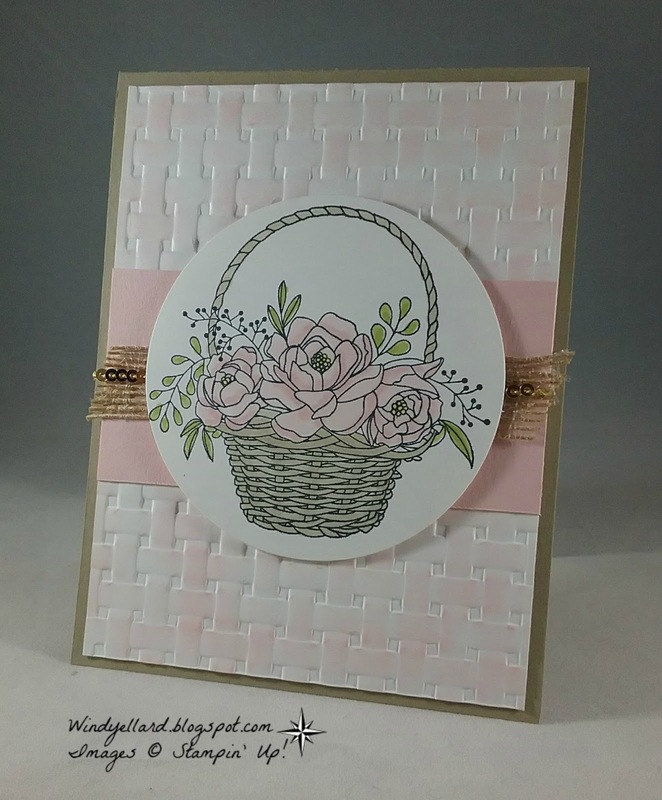 the Basket Weave embossing folder together. 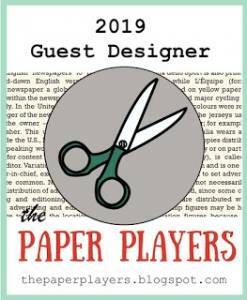 I love that the folder is carrying on to the new catalog in June! 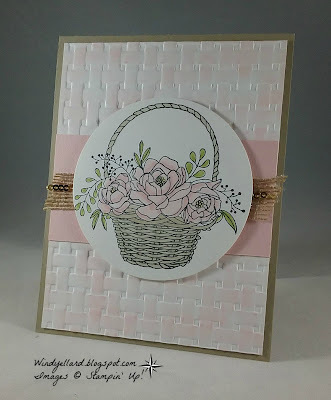 I am finally playing with the basket and used my Stampin' Blends to color. a bit of burlap ribbon and mini gold sequin trim for bling. added the Pink to the folder. I placed it all on a Crumb Cake base to finish it off. 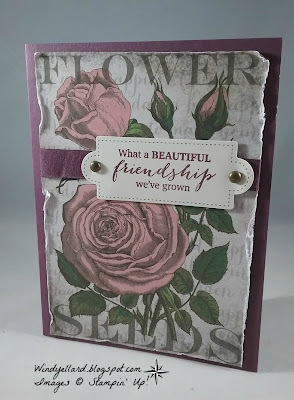 and stamped in the same color some roses over it from Cake Soiree set. 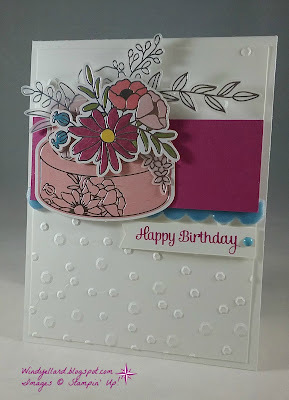 I layered the cards and then added a circle die cut in Whisper White. 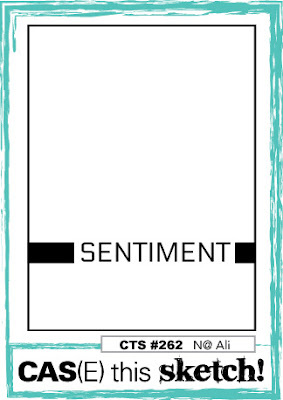 from the kit under my sentiment. 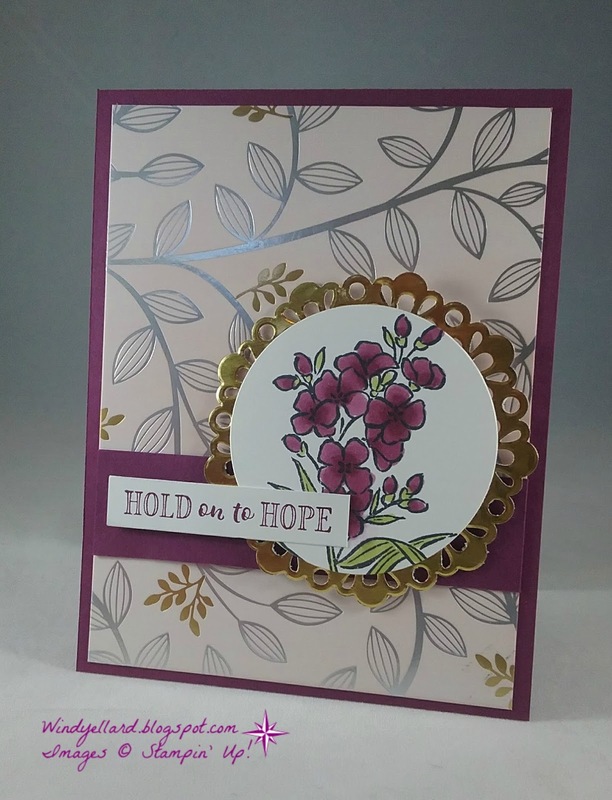 in Berry Burst on Whisper White to finish the card. So quick when kits are there and waiting for you! Hope you enjoy your weekend and thanks for stopping by! I looked over at my Hello Easter that has been sitting near by! I decided to color the sections of the egg 5 different rainbow colors. I water colored them on the paper. I did hand cut the egg out. 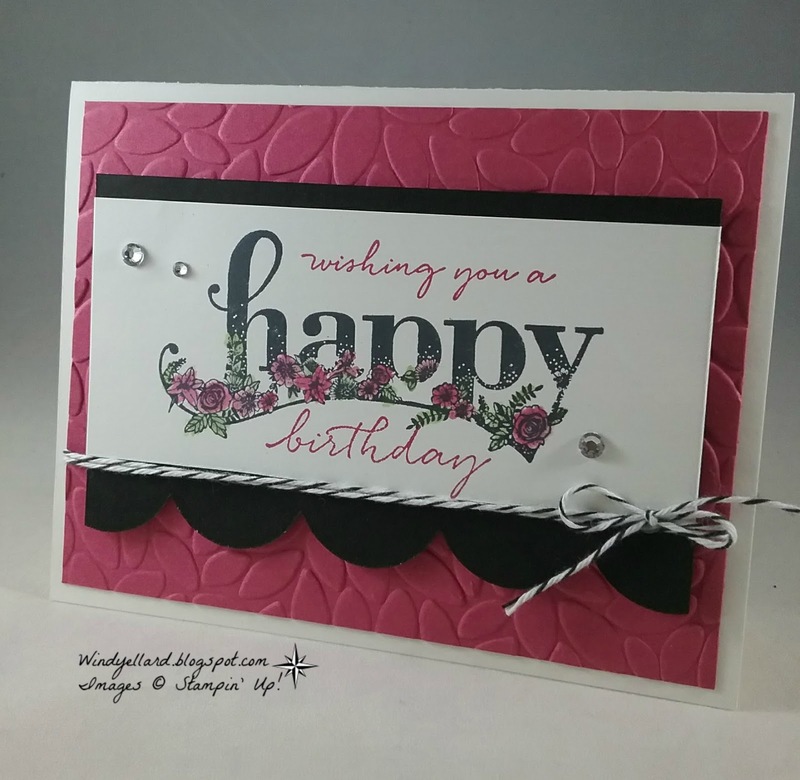 I added the banner in Rose Red card stock stamped in Memento Tuxedo Black. cut using the Sweet Cake thinlits dies. like it is sitting the grass. a piece of thick Whisper White for a base. I added some rhinestones for bling to finish it off. 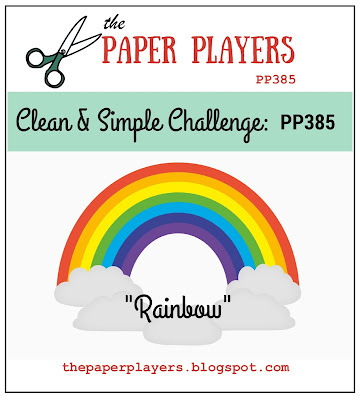 to play along with the rainbow challenge! I hope you have a blessed day and Happy Spring! 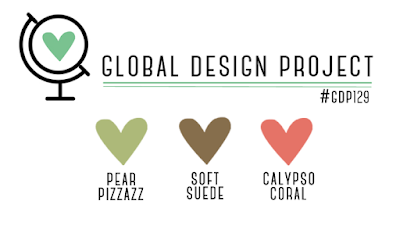 but was not coming up with a design I liked. I ended up doing a Brusho butterfly for classes. 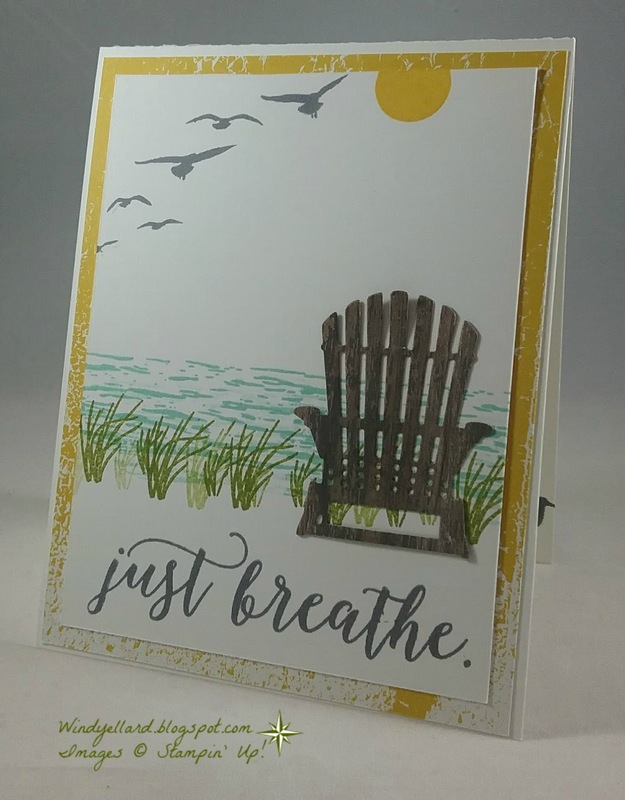 then stamped on the Whisper White card stock. Naturally Eclectic DSP with the jewel print on bottom. 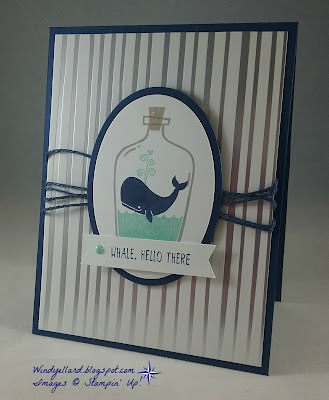 and layered some navy card stock behind. I place all this on more Navy then a Emerald Envy card base. I finished it off with some rhinestones with the sentiment. I hope you have a lovey day and thanks for stopping by! 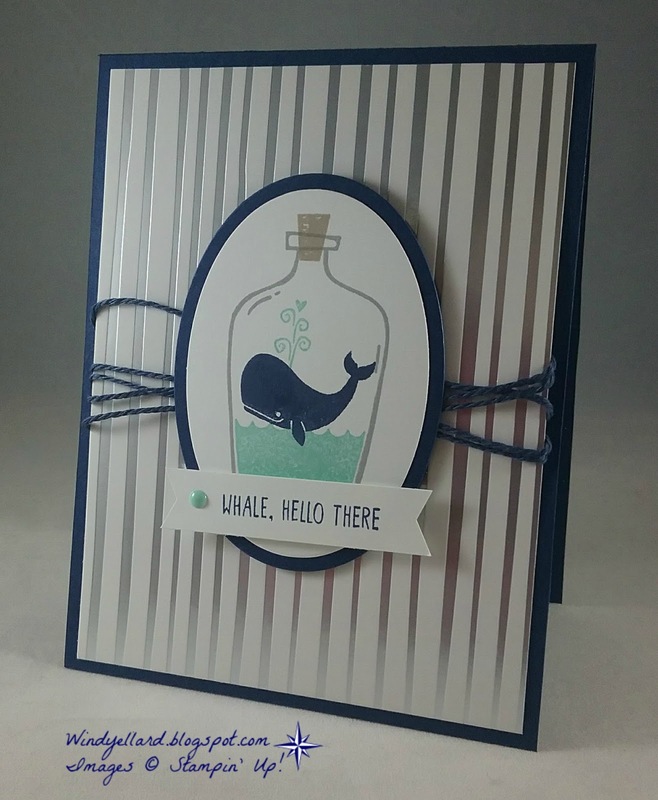 I made this card for my friend's birthday a few weeks ago. 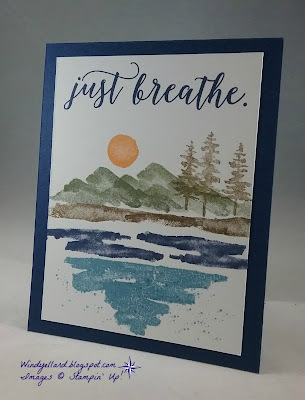 relax vibe of this card, too. 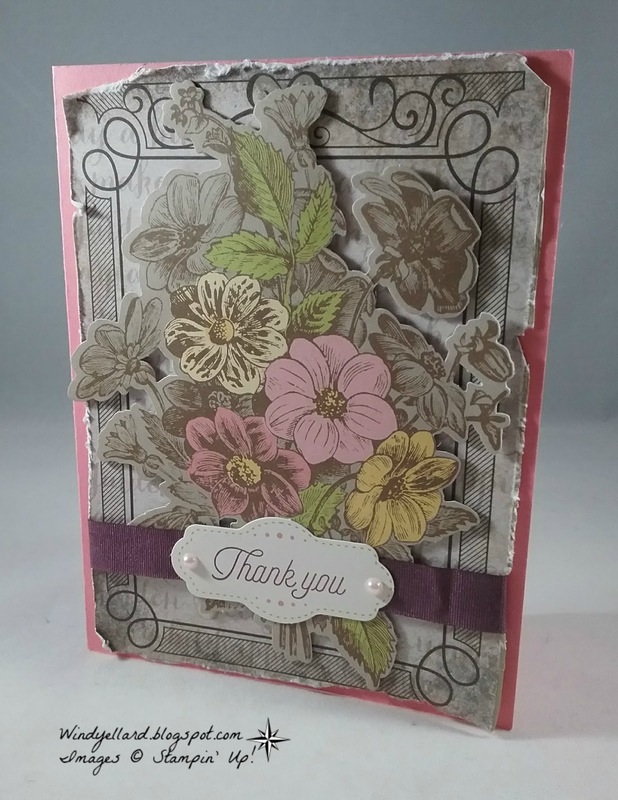 cut from Seasonal Layers thinlits dies with the Wood Textures DSP. in Basic Gray finishes the relaxing card. 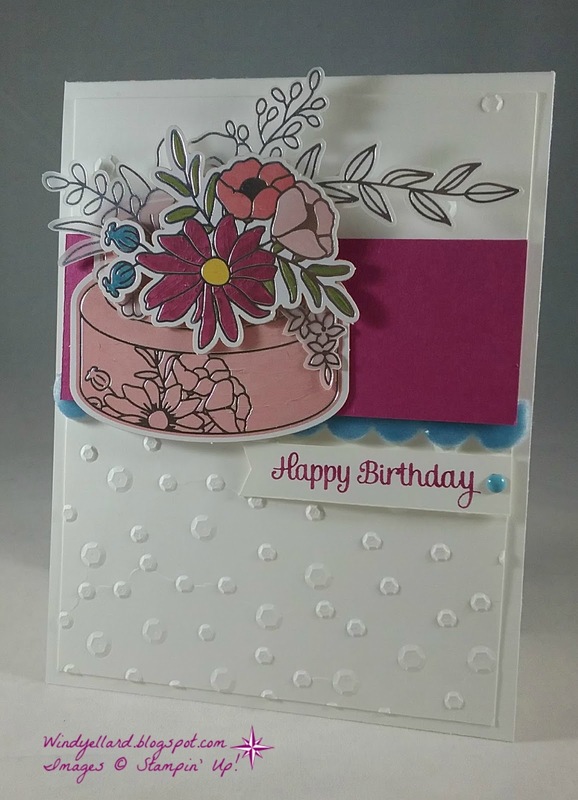 I did stamp a Happy Birthday and more birds inside the card. Hope your day is relaxing and thanks for stopping by! I needed to pull out my Picture Perfect Birthday suite of stuff and use them! stamp one of those party blowers! 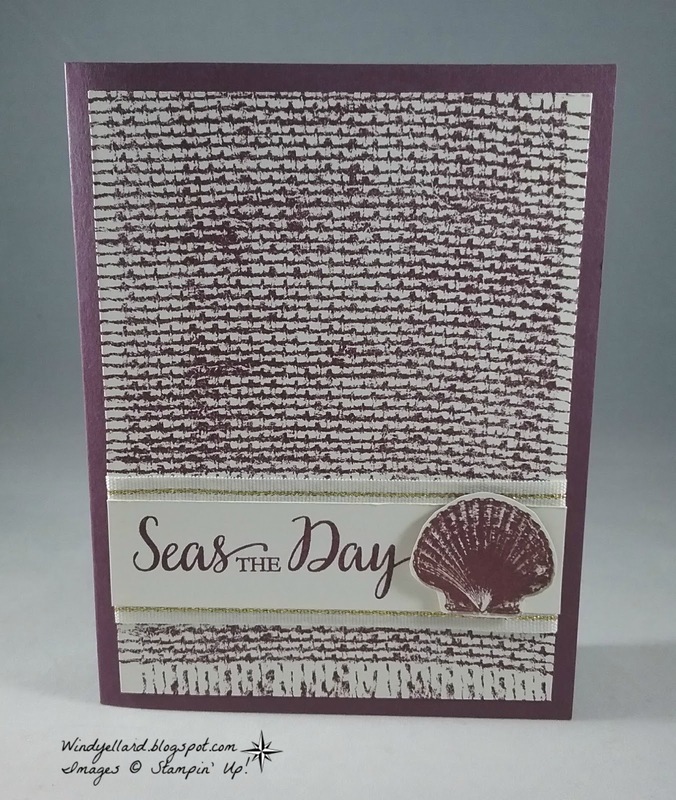 card stock ran through the Simple Stripes embossing folder. I grabbed the Picture Perfect Party DSP and picked a pattern. dots over it. 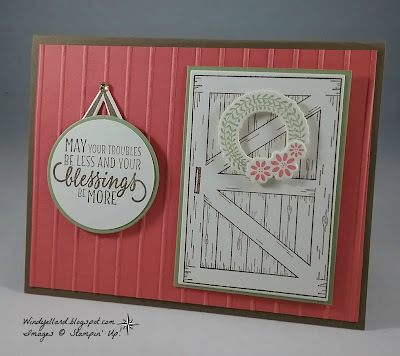 I then stamped the end in Berry Burst and the fringe in Bermuda Bay. All that I had to cut by hand and layer together. 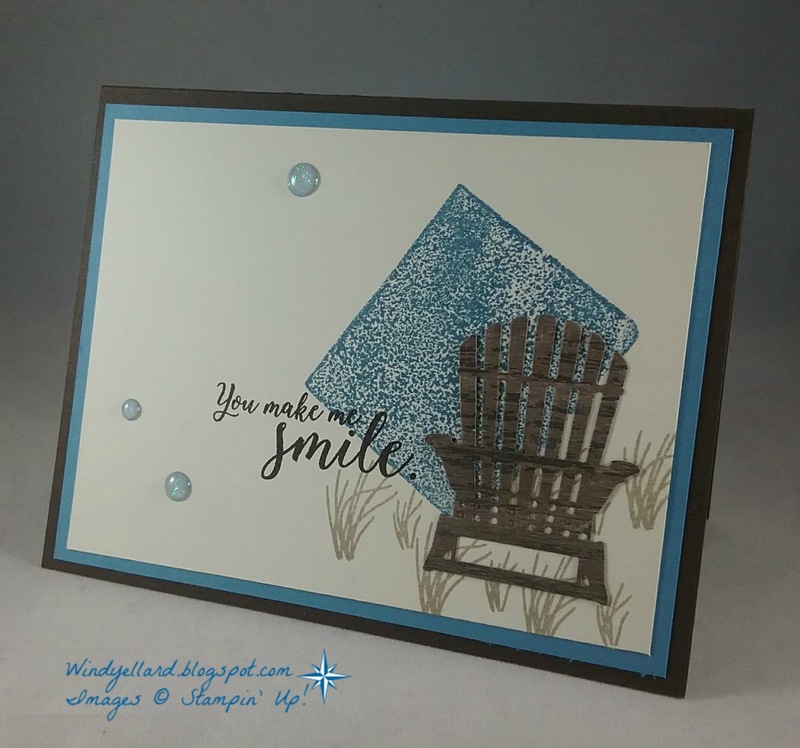 and finished it off with a Bermuda bay enamel dot! Oh Springtime! It is feeling like it is Florida! We are planting flowers in the yard this weekend! 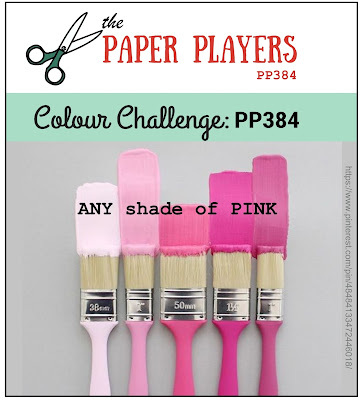 roller/brayer to roll lots of Powder Pink ink on the paper. It is not dark but gives it a soft feel especially with the metallics. as well as for the base of the card. 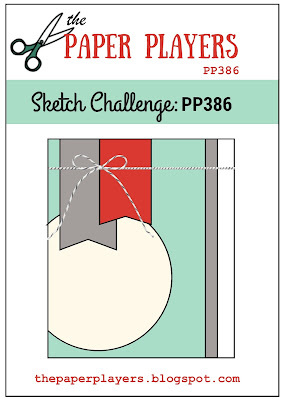 with this sketch challenge this week. Wood Textures DSP using the Seasonal Layers thinlits dies. Espresso ink. I layered the background on a piece of Marina Mist. Then placed it on a Early Espresso base. I finished it off with some glitter enamel dots. I like the clean simple beachy feel. when I saw this color challenge. I knew I could make it work with this set and matching dies. 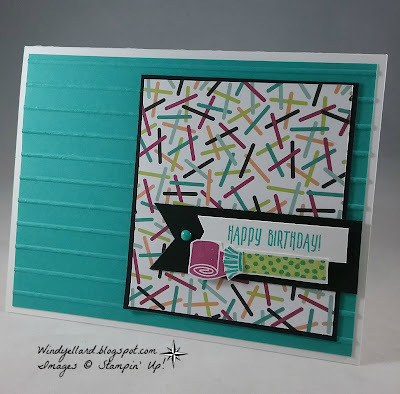 embossed with the Simple Stripes embossing folder for a siding look. and used the die just for the flowers. I popped the wreath on the door and decided to make the sentiment hanging also. 1 3/4" punch and the layered it with a another circle in Pear. and added a gold dot to look like a shiny nail. I pulled on two shades of pink- Powder Pink and Berry Burst! 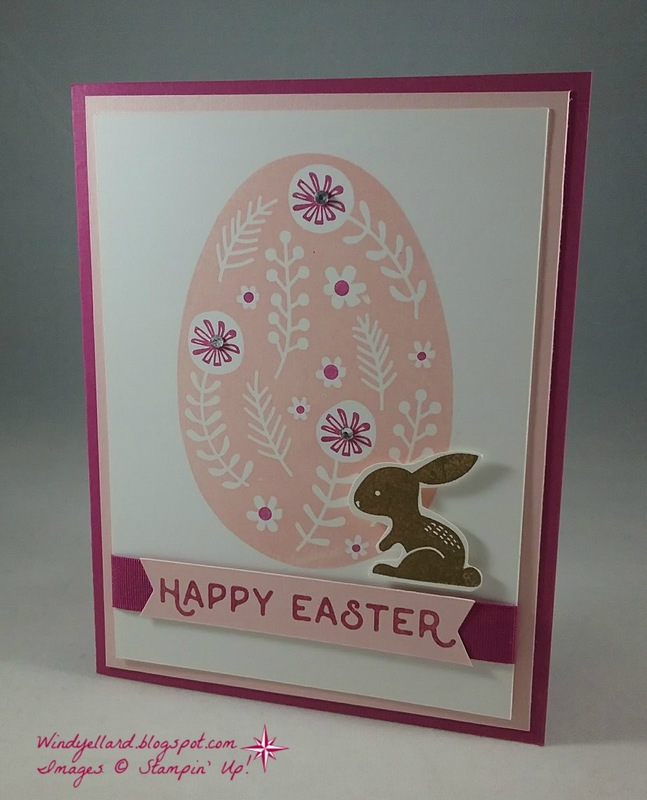 I wanted to use the egg and bunny more from Hello Easter. I stamped the bunny in Soft Suede and hand snipped him. in the Berry Burst on the Whisper White background. banner punch-retired. 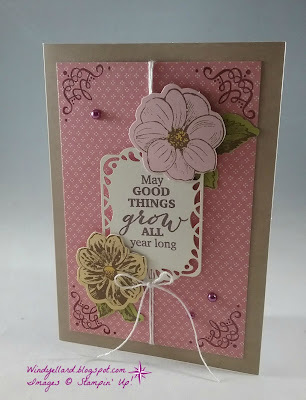 I then layered it over the Berry Burst ribbon. 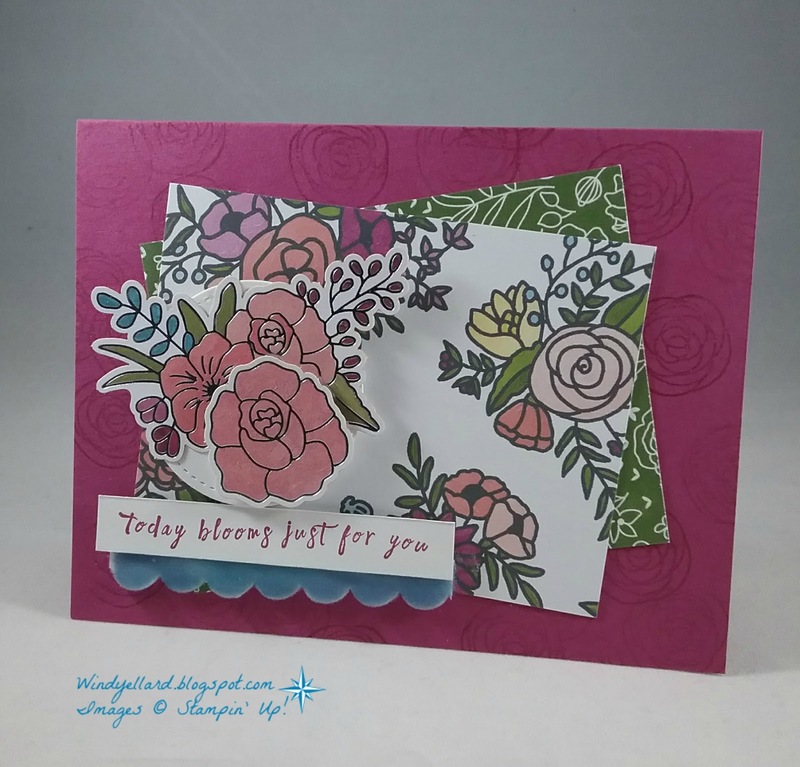 I layered the White on Powder Pink and then a Berry Burst base. I finished it off with some bling on the flowers. 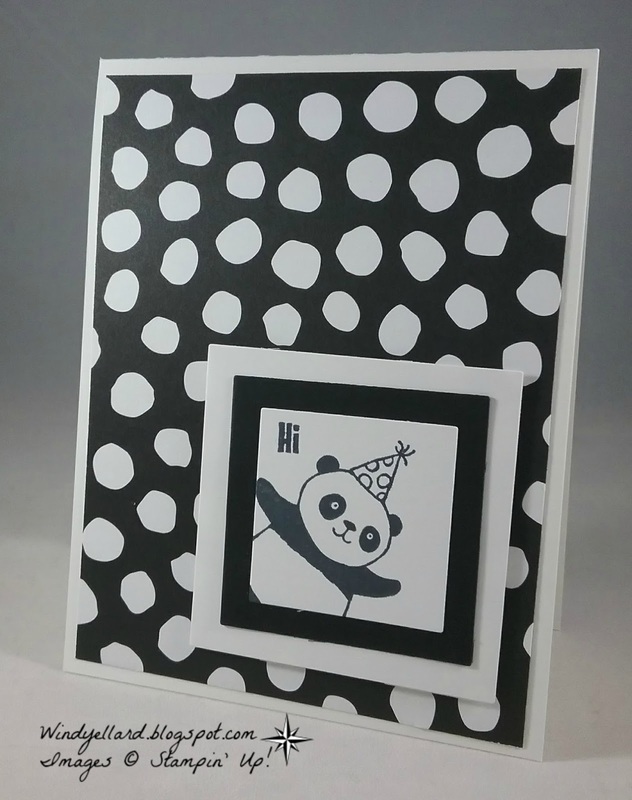 A simple Panda card in Black and White was so easy and cute! 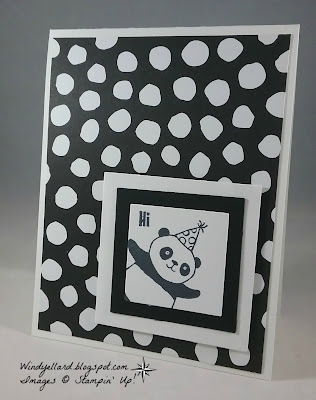 party hat for in side with a Hi from Party Pandas stamp set. My mom will really like this so I will mail it out to her this week! so I just had to pull it out. I inked it up with Fresh Fig and stamped it on a piece of Very Vanilla. 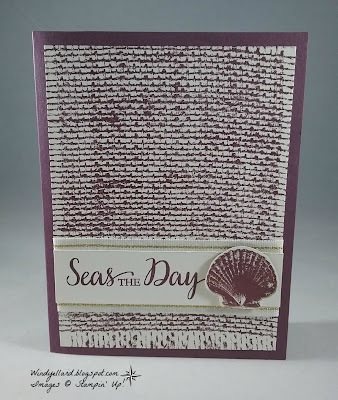 of Vanilla and added a shell stamp all in the same Fresh Fig ink. I layered some Natural Gold trim behind for a pop of gold. I finished it off with a Fresh Fig base. before layering on my Old Olive card base. in Memento Tuxedo Black ink on thick Very Vanilla card stock. 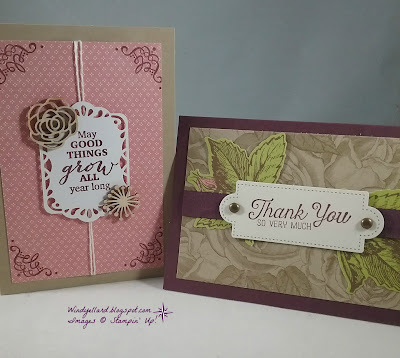 I used my Stampin Blends markers in Rich Razzleberry and Old Olive. square on a another square in Rich Razzleberry to finish it off. Cole loves anything in the Marvel Cinematic Universe (MCU). as soon as I saw the sketch at freshlymadesketches.blogspot.com this week. 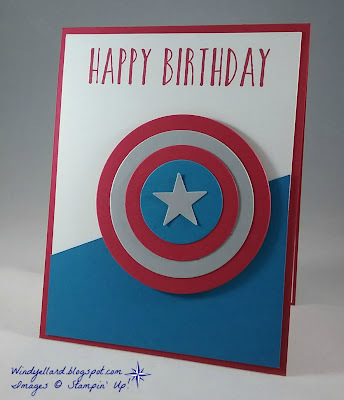 Perfect timing as I sat down to make his card. 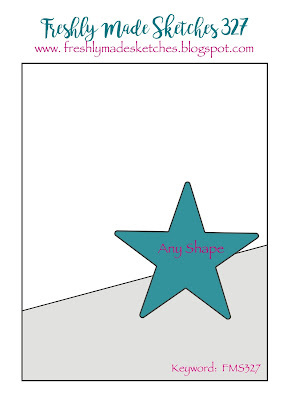 and then punched out the star in Smoky Slate. The punch is an old star punch I kept around and times like this, I am glad I did! I simply stamped the Happy Birthday from Perennial Birthday in Real Red. He would not care for any bling or other special effects so kept it simple. virtual reality games today and then go eat a big birthday dinner! Hope you have a fun day, too!